In my invention I construct a wheel having a flat face, and upon this face I secure peculiar-shaped buckets which are adapted to receive the stream from the nozzle and divide it, so that the two parts of the stream are directed into the curved bottoms of the two halves of the bucket, and by means of the inclined or flaring sides the two streams are caused to react and escape smoothly at each side, so that the whole reactionary force of the water is utilized, and the water is discharged clear of the wheel and the following bucket.... This action of the water causes it to be delivered upon the wheel with the full force due to its momentum, and in passing through the curved bottom and up the inclined sides the reactionary force due to this change of direction is also added to the primary power to assist in driving the wheel. Pelton wheels are still used today for hydropower generation. 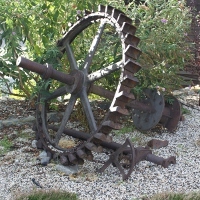 The site is currently a cultural center with several Pelton wheels and other mining hardware on display on the grounds. One of several Pelton wheels at the site. Closer view of the curved, split buckets on the wheel above.